Rita Angus: Life & Vision opens at Christchurch Art Gallery this weekend. I’ll be heading down for the official opening tomorrow evening. On Saturday I’m doing a floortalk in the exhibition at noon, the first in what looks like a great line-up of events alongside the show. It’ll be nice to see the works again and also to see how they look in a different context. For the gallery I’m sure it’ll be good to have paintings like Cass and A Goddess of Mercy back home, if only for a while – the exhibition heads to Auckland Art Gallery later in the year. 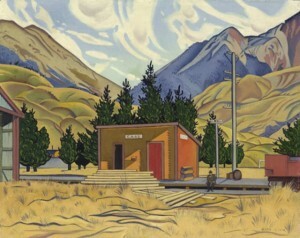 Many of the paintings are returning home in another sense, as Angus lived in Christchurch on and off between 1927 and 1953. Some works, including the most well-known of all her self-portraits, were painted in Angus’s studio at Cambridge Terrace. Others, such as Rutu and the enigmatic Landscape with sea had their genesis when Angus was living at Clifton, looking out over the estuary and beyond to the Pacific. Although I lived in Nelson for a while which has very strong art connections, I have found the arts community in christchurch very strong. I love the art Gallery in New Brighton. This was a truly extraordinary exhibition. I took my mother along with me and we both enjoyed it very much. Well done Te Papa on compiling such a marvelous collection.